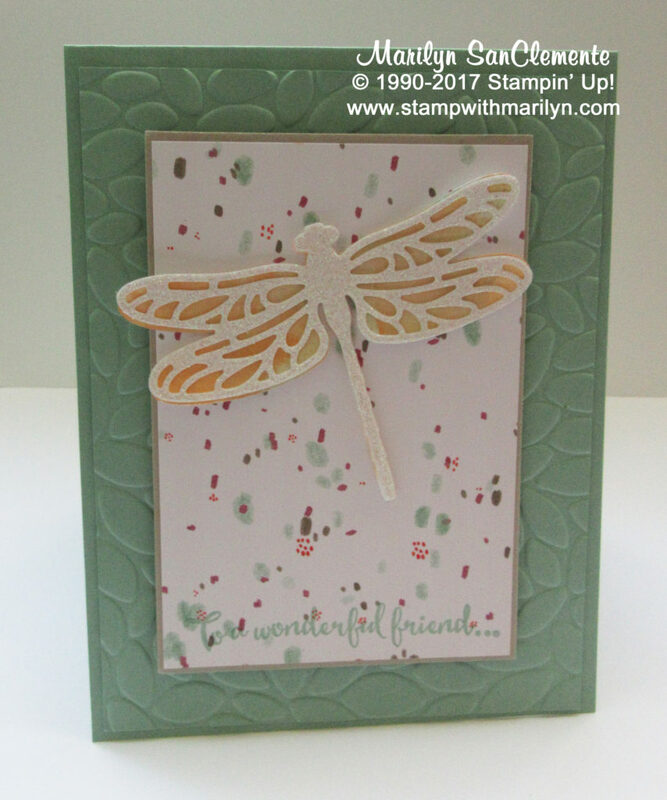 Today I am sharing a card with the Beautiful new Dragonfly Dreams stamp set from the Stampin’ Up! Occasions catalog which goes live on Wed. the 4th! This is one of my favorite stamp sets in the new Occasions Catalog! One of the things that I love about the Dragonfly Dreams set is that the Dragonfly is two part. This means that there is a stamp for the background and another for the detail of the dragonfly. Well, the coordinating Detailed Dragonfly thinlits are the same. There is an outline of the dragonfly and then a detailed thinlit to cut a detailed dragonfly from coordinating paper. When I think of dragonflies, I think of a watercoloring effect. Dragonflies are not one color. They are a blend of colors! So I used a watercoloring technique to color the dragonfly before I cut out the background image. Here are the details of this card! 4 1/4″. Next is a layer of Mint Macaroon cardstock cut to 4″ x 5 1/4″ and embossed with the Petal Burst Embossing Folder. The front panel is a piece of the Succulent Garden Designer Series Paper cut to 3″ x 4 1/4″. This is layered onto a piece of Sahara Sand Cardstock cut to 3 1/8″ x 4 3/8″. The sentiment “to a wonderful friend” is stamped with mint Macaroon ink on the bottom of the designer paper. 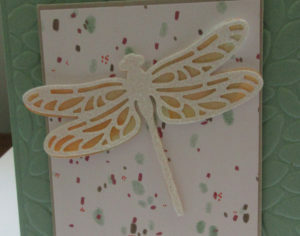 For this card, the dragonfly is colored using a blend of Peekaboo Peach, So Saffron and Mint Macaroon inks. I used an aqua painter to brush ink across the cardstock and then cut out the dragonfly shape. Next I cut out the detailed Dragonfly shape from a piece of Dazzling Details Glimmer paper. It is hard to see in the picture but the Glimmer paper really adds punch to the Dragonfly! This card and set are inspiring me to prep a class on Watercoloring techniques! Especially with the Stampin’ Up! Watercolor pencils coming back! Stay tuned! These items will be available for ordering on Wed. the 4th!